There's more to our paddle blades than good looks! Hornet Watersports is a well-known brand for dragon boat equipment. Hornet offers wide variety of products for your dragon boating needs. Do not be fooled with other brands that do not have a proper IDBF licenses. Do your research properly before buying a no name paddle brand. Construction: 1 piece construction between blade and lower shaft, combined with an adjustable top portion where the handle (grip) is 1 piece with the top shaft. Holding these two pieces is an aluminum mechanism that can be adjusted with a key (included). Whether club racing or heading to international competitions, you'll tear through the water with this outstanding piece of kit. While you're there, the stylish, eye-catching graphics will make you the envy of teammates and competitors alike! PERFORMANCE DRAGON BOAT PADDLE: Carbon fiber paddle with IDBF License #3523 and new ergonomic handle. This is our latest paddle, the STING paddle. 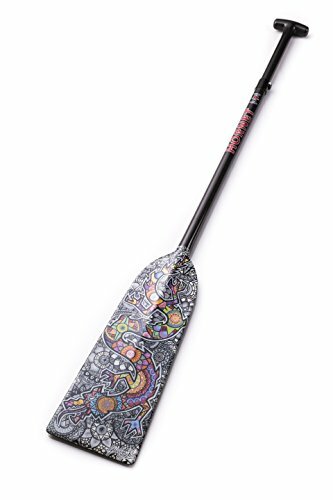 LIGHTWEIGHT GRAPHIC PADDLE: This paddle weighs only 15 oz. and the graphic design is on BOTH sides of the paddle. REINFORCED EDGES AND GRAPHIC DESIGN: Our edges are reinforced with fiberglass to make the paddles extra durable. Our beautiful designs are printed directly onto the carbon fiber. 1 YEAR WARRANTY: Hornet Watersports paddles are backed by a 1 year warranty. If you have any questions about this product by Hornet Watersports, contact us by completing and submitting the form below. If you are looking for a specif part number, please include it with your message.